Ski holidays in the Alta Badia region of the Dolomites give you access to a local ski area which is made up by six inter-connected villages: Corvara, San Cassiano, La Villa, Colfosco, Badia and La Val. The region is one of the most popular of South Tyrol's ski areas. Apart from the excellent local ski domain there is also access to the world’s biggest ski carousel with direct links to the Dolomiti Superski area. This gives unimpeded access to 450 lifts and 1,200km of pistes (an area which is impossible to fully explore in a week's holiday) between the altitudes of 1,300m and 2,778m. The height of the Alta Badia area provides optimum skiing conditions from mid December through to end March and offers an extensive ski area of 130km of superbly prepared pistes (70km blue, 52km red and 8km black – one of which is the world class black run: the Gran Risa), with the unique backdrop of the majestic Dolomites. There are 53 fast and comfortable lifts with almost no queuing or crowding at the lift stations, or on the pistes. Apart from quiet slopes ski holidays in the Alta Badia are ideal for families with children as around half the pistes are blue runs. There are also brilliant ski kindergartens in each of the villages in the area. 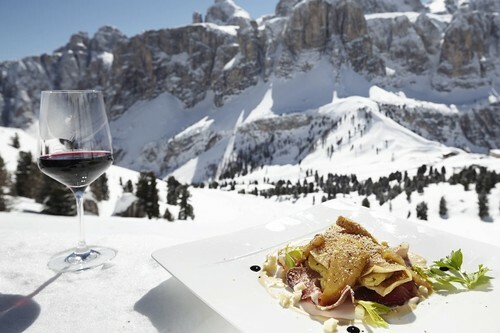 San Cassiano has a number of fantastic restaurants (two with Michelin stars) offering truly superb cuisine. For a luxurious stay the Hotel Rosa Alpina is definitely the place to stay. With peaceful and elegantly decorated rooms, a luxurious spa and an indoor swimming pool this hotel really is amazing - book early to avoid disappointment. The hotel's beating heart is its two Michelin star restaurant, St Hubertus, surely one of the finest in the whole of Italy. The next door village of La Villa is also small and very unspoilt. It does not offer the same in-resort 'fine dining' experience of San Cassiano and is popular with a more cost-conscious visitor. However, guests staying here have access to the same great collection of traditional mountain restaurants serving superb food. The Chalet Hotel Al Pigher is a great value accommodation option in La Villa. Corvara is a pretty village located on the Sella Ronda circuit and the western edge of the Alta Badia region. It offers a great collection of charming and very comfortable hotels and is the most lively village within the Alta Badia area, with countless tempting restaurants and bars. For a delicious pizza or the 'best profiteroles in the world', try the Pizzeria Restaurant Fornella which is very popular and often packed, make sure you book a table if you are planning on going. There is a large range of great accommodation choices in Corvara. The 4 star Hotel Col Alto has an extensive spa and wellness centre and is also known for its traditional gourmet food and fine wines. Ski holidays in the Alta Badia area offer a huge range of good value accommodation choices, some truly superb luxury hotels and great skiing for all abilities with unrivaled mountain cuisine. To enjoy a ski holiday to the Alta Badia fly to Innsbruck airport - the transfer time to any of the Alta Badia resorts by road is approximately two hours. Alternatively fly to Venice and maybe stay here for one or two nights before continuing your holiday in the mountains. The transfer time from Venice is two hours 45 minutes. For a bespoke ski holiday itinerary to the Alta Badia with, or without, a stay in Venice please do call our team.